When denied access to a file or folder in Windows 10 or Windows 7, one of the easiest ways around it is to Take Ownership of the file or folder. When denied access to a file or folder in Windows 10 or Windows 7, one of the easiest ways around it is to Take Ownership. This tip comes in handy when you’re dealing with stubborn system files and folders that don’t want to give you access. 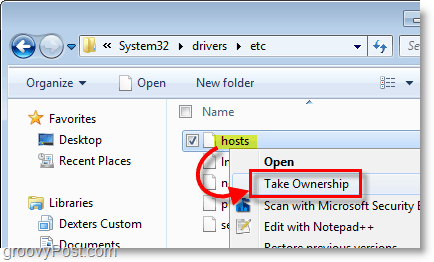 Normally this is a long process involving several command prompt lines or user interface clicks, but today I’m going to review how to quickly add the Take Ownership option to the Windows right-click context menu for the easiest 1-click access possible. 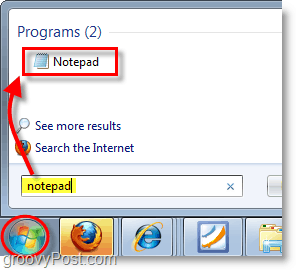 Open the Windows Start menu, type: notepad, and press Enter. Alternatively you can skip straight to Step 4 by just downloading the pre-made registry fix. 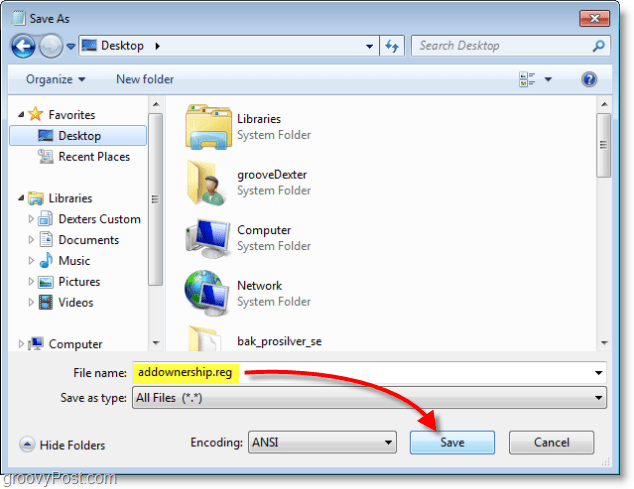 Save the Notepad file as addownership.reg. Make sure the file name ends with the .reg extension. Right-click your new .reg file and select Merge. You can also double-click the .reg file. A warning displays telling you that editing the registry is dangerous. Click Yes and then click OK on the next confirmation dialog box. Now when you have a file or folder you want to change and you don’t have permission to, you can easily right-click the file or folder and select Take Ownership. It’s much easier than doing it the long way (which we won’t even get into). Once you have ownership of a file or folder, you can move it, rename it, edit it, or do whatever else you need to do with it. Again, you can also add the Take Ownership option to the right-click menu using our pre-made registry fix. Very handy, thanks a ton! Just to note…. you have funky quotes enabled in your editor for this post. Not sure what that would do if someone tries to import it into the registry, but I’m guessing it would be bad. Your premade download looked good though. @James – Thanks for making me aware of that. Something is funky with my CSS so I “fixed” it for now. Will need to update this with a proper insert code plugin or something. Thnx again. Thank you so much! I jumped from XP to Win7 last week and this was annoying the snot out of me. Windows was locking my public folders in Explorer so I couldn’t move files around easily when transferring to my mp3 player. Fixed! @Jill Excellent! Glad we could help out! Welcome to groovyPost! Worked great. Thanks for the help. Will this feature be applied only in the profile v create the registry entry? or all the users enjoy the sneak? can anyone help please ??????????? It seems like a ‘big project’ when you right clicked ‘takeownership’ on the locked file, the computer ran like mad for few minutes and in the end the name on the locked file which I intended to change still cannot be changed!!!! same binary error msg. any idea next? A billion thanks, I tried following the required permissions route, I was like three hours and still silly padlock on the folder, now it has gone, genius work. taking ownership did not open the denied access file. Thanks for the reg file. 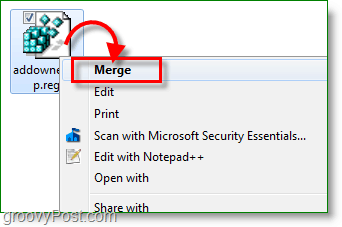 If you keep getting that error when trying to merge here is the solution! JUST DON’T COPY THE FIRST LINE OF THE TEXT IN THE NOTEPAD. i compared the pre made registry vs the code above. i think the reason the code above doesnt work is because all the “forward slashes” for the directory e.g. [HKEY_CLASSES_ROOT*shellrunascommand] were not present therefore won’t be regonized as a valid registry script. on top of that, you need to exclude both “ ” at the first and last part of the code since it’s a web script. Thanks for pointing that our Edano – Fixed the article.